Source: Reformatted article on pages 232-250 of Transactions of the American Ceramic Society, Volume VII–Part II: Containing Papers and Discussions Read at the Meeting Held at Birmingham, Alabama, Jany. 30 and Feby. 1, 1905, With Some Other Contributions. Some spelling and punctuation has been edited. By Ellis Lovejoy, Columbus, Ohio. The development stage of dry pressed bricks is long since passed, and we are now working out the minor details to improve the product, and to lower the cost—particularly the latter. It is not my intention to describe the process, but to take up some of the questions which trouble us, and others which mark the limits of the process, and I shall have occasion to depart from my subject and trespass on that of the mud process. The recent convention of sand-lime brick manufacturers reveals that they are going through the troubles of the dry clay process, and it is fortunate for them that their process has not come up sooner, for our experiences have brought about the development of the presses, and made sand-lime bricks possible. There are three distinct types of dry presses in general use, viz: the hydraulic, the toggle joint, and the roller cam. In the hydraulic the pressure is direct from top and bottom without any movement of the brick in the mould while under pressure. The pressure in the original toggle joint machine was similar, and the strain was transmitted to the frame of the machine. The roller cam gave an entirely different pressure. While the pressure was being applied both top and bottom plungers were descending in the mould, but the upper one faster than the lower one. At the bottom of the stroke the motion was reversed and the bottom plungers traveled faster than the top, until the final pressure, when the top plunger was quickly raised, and the brick lifted to the top of the mould box and taken off. The roller cam is not limited to just this motion, but such was the motion of the first machines introduced into this country, and its successful operation brought out American machines following substantially the same lines. The idea was to keep the clay in motion in the mould box while under pressure, and through the friction of the clay against the sides of the mould box, knead the clay into a homogeneous mass. The direct pressure types produced the much-discussed granulated or “weak” centers, and the range of material they would work successfully was limited, while on the roller cam, it was possible to work any kind of material. Sand lime bricks would have been a difficult problem on the earlier direct pressure types, but on the roller cam, we worked successfully, not only crushed sandstone, but what was more difficult, flint clay with a large percentage of calcine. In the improved toggle machines, the plungers with the toggles are attached to massive steel side bars, which receive the strain of the pressure. While the pressure is being applied, the whole pressing mechanism is lowered and raised—the mould boxes remaining stationary—and thus the clay is given the kneading motion which wipes out the granulated centers. The hydraulic has not yet overcome the difficulty. It is not my intention to enter into a discussion of the merits and demerits of the several machines on the market. A detailed description of them would be out of place and superfluous, but I wish to record my disapproval of a statement made to me by a prominent machine man—not intended for publication—namely, that the clay business would not warrant the production of first class machinery. Foundry machines may sell for a few years, but eventually they are driven from the market by the product from the machine shop. I believe that several good ideas in dry press machines have gone down through inferior construction. On any machine in which the plungers approach each other and squeeze the clay toward the center of the mould, the brick will show a comparative granulation on this center plane, due to a lack of density, quite noticeable even at some distance. If the pressure is all from the top, the granulation will be at the bottom, and its position will depend upon the relative degree of motion of the two plungers. This granulation was attributed to the included air, and all machine manufacturers provide for its escape, either through air holes in the plunger plates, or by releasing the pressure before the final pressure is applied. Naturally any included air under pressure will tend to counteract the compression of the clay, and its effect will be greater at the center of the brick where it has the least chance of escaping, but admitting the effect of the included air and the desirability of allowing it to escape, yet it is not sufficient to account for the granulated surfaces which we get in practice. Dry or semi-dry clay will not flow under pressure. If a tube punctured with holes from top to bottom to allow the escape of the included air be filled with dry clay, and pressure be applied at the top, we will get a column of clay decreasing in density from top to bottom, due to the friction against the walls of the tube and the immobility of the clay. A hand press which I used for a number of years applied the pressure just as I have illustrated in the tube. One plate was fixed, and all the pressure was from the other plate. There were no air holes in the sides of the mould, but the air had ample opportunity to escape around the edges of the fixed plate. All bricks made in that press decreased in density from the side next to the moving plate to the side against the fixed plate, that is, from top to bottom. In making moulded bricks—a cove for instance—it is necessary to put a loose form in the mould box before putting in the clay. This form rests on the bottom plunger plate and moves with it, and to the height of the form shuts off the clay from the friction of the sides of the mould box. If the form is one and one-half inches high, then there is about one inch above it, forming the capital of the moulding, which comes in contact with the sides of the mould box. If we fill the mould box with five inches of loose clay which must be compressed to two and one-half inches in the body of the brick, there is three and one-half inches of loose clay over the form, which must be compressed to one inch, unless the clay will flow into the body of the brick and around and to the bottom of the loose form. Some of it is forced out and packed around the form, but so poorly does it accommodate itself to pressure, that the result is a densely packed face—oftentimes to the bursting point—on the capital of the moulding above the loose form, and from there to the bottom a relative loosely packed face decreasing in density to the bottom. The opposite face, or back of the brick will have the uniform density from top to bottom that the whole brick would have had if the loose form had been left out. Figure 1 shows a section of the mould box with loose form. Above: Figure 1. Diagram showing pressure conditions in brick mold. 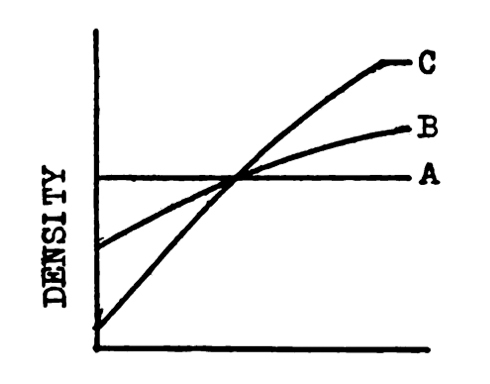 Figure 2 illustrates the densities by coordinates, the ordinate being the density, the abscissa being the vertical height of the brick, and the curves A, B, and C, show the densities along the sections AA, BB, and CC. This is merely an illustration to explain the text, and not a showing of facts. Above: Figure 2. 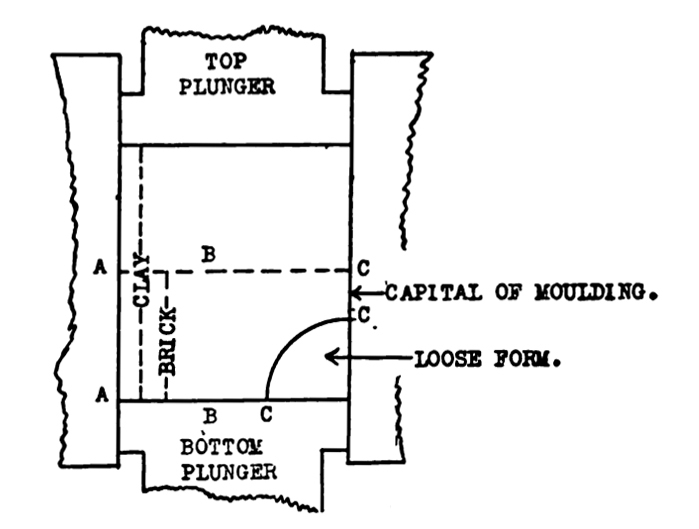 Diagram showing density relations in brick mold. In the roller cam motion the clay is most compressed at the top and least at the bottom during the downward stroke, with the reverse during the upward stroke. The loosely packed clay in the bottom offers little resistance to being forced downward in the mould, while the densely packed top offers great resistance to being forced upward during the upward stroke, to the advantage of the bottom of the brick in density. From a scientific standpoint it would be absurd to assert that the total pressure received by the top of the brick is equal to that received by the bottom, and that each is equal to that at the center of the brick. In practice, however, we notice no difference, and the brick to all intents and purposes is uniform in density from top to bottom. The later toggle machines recognize the probability of this difference in the top and bottom, and provide for it by an arrangement which in a measure reverses the motion at any point in the stroke. The claim has been made that the motion of the brick under pressure in the mould does not remove the granulated centers but simply glosses them over, and this claim is reasonable since the centers are only removed through friction against the sides of the mould. In practice we do not recognize any difference in density throughout the brick, but from a theoretical standpoint we cannot believe that the effect of the friction against the sides of the mould will extend to the center of the brick with a material so irresponsive to pressure as dry clay. We believe that the internal core of the brick will have less density than the faces. If this be true, then the faces being uniform in density, and the central core lower, the top and bottom sides above and below the central core must have greater density than the faces. If these differences exist they are too slight to be noticeable in practice, but they may account for some of our troubles in drying and burning such a body as dry clay, in which the bonding element is not developed as in the wet process. It was my privilege to be early in the fight for dry press brick. Our factory was the first in Ohio, and so far as I know, the first successful factory east of the Mississippi. Our first difficult problem was that much-discussed one of efflorescence, which appears on the face of the bricks after they are laid in the wall—a trouble not limited to the dry pressed products, but to which they were particularly susceptible because of the impossibility of making them impervious. An analysis soon proved it to be a sulfate of the alkalis, lime, etc. The discussions of the time in regard to it would make interesting reading to those of us who went through it without Seger, and without any literature except Prof. Cook’s report on the clays of New Jersey. The alkalis and impurities in the clays gave us at once half of the answer to the problem, but how to account for the sulfur was another matter. Some said it came from the mortar, and this served its turn, but did not convince those of us who found it coming out on the face of the bricks in the piles on the yard. We tried to make people believe that it came from the atmosphere in our smoky cities, but the trouble was not confined to cities. I reported to our company that it must come from the sulfur in the coal used in burning, but could not reconcile the fact that the clay on our property with the least alkali showed the most efflorescence. We abandoned its use on this account. To our chemical work must we lay the blame for not sooner discovering the source of our trouble. “Loss by ignition” covered far more than the innocuous combined water which we were reporting. Prof. Orton has shown us the effects of the carbon which appears in our analyses as combined water, and also mentions the sulfur which finds no place in our reports. It was called to my attention accidentally. One of our miners brought me a bunch of roots taken from the clay in which the carbon had been replaced by sulfide of iron. This led to an examination of the clays, and I could find none free from sulfur. It became like a puzzle of which you see the end. Many peculiar and contradictory things were explained. Cause and effect, of which we had begun to doubt the truth when applied to clay, fitted into each other, and our confidence in its truth was re-established. We knew why unweathered clay would not effloresce in the wall, and why the same clay weathered would effloresce. We knew why crop clay was dangerous to use. We knew why a clay with less alkali might be worse than one with more. The solution of the problem with us was simple. We abandoned the traditional weathering of our clay and used only unweathered clay from our mine, hurried it through the mill, into the kiln, roasted out the sulfur, giving nature no change to convert the sulfide into the sulfate, burnt the product hard enough to absorb the alkalis and lime, and sent the bricks to the market with a guarantee that they would not effloresce, and incidentally wiped out the loss account. This was in 1887, and in a paper before the Ohio Institute of Mining Engineers, these facts were published. It was not until Seger’s work appeared in America that we fully understood the color phenomena of efflorescence. Hard burning is necessary to prevent the formation of the efflorescence. Not only must all the sulfur be roasted out, but also all the alkali and lime must pass into combination and such a degree of combination as to be practically indestructible. There are numerous instances of bricks being in the wall for years before showing any efflorescence, and it seems to me that the explanation is in the disintegration of some of the low temperature silicates and the absorption of sulfur from the atmosphere. In the weathered clays, the chemical changes of oxidation result in the formation of sulfates of the alkalis, lime and magnesia. Sulfate of lime does not decompose at temperatures attained in our brick kilns, or at least not to any great degree, and it passes into the brick comparatively unchanged. Sulfates of the alkalis are not decomposed by heat, and under no circumstances in practice can we believe that they are completely volatilized, nor that they are decomposed by silicic acid and form silicates. Even if such silicates were possible, their permanency is doubtful. Disintegration will take place, followed by the formation of alkaline carbonates from the carbon dioxide in the atmosphere, and the reaction between the lime sulfate and these carbonates results in the formation of the alkaline sulfates of which the wall efflorescences essentially consist. In short, the sulfates in the clay continue through the kiln, and the leaching action of rain and sunshine bring them to the surface. Barium, so successful in the wet process, is not equally applicable to the dry process. Solution must precede chemical reaction. I have frequently found crystals of calcium sulfate like coarse salt scattered through the clay. Calcium sulfate requires about 400 parts of water for solution, and such crystals will not go into solution in the dry or even semi-dry process. Assuming that they are in solution, not enough barium carbonate, which requires 14000 parts of water, will go into solution to make the precipitation complete. The undissolved barium carbonate is converted into the oxide in the kiln and passes into silicate combination, and its usefulness is at an end. Seger has pointed out the danger in using barium chloride instead of the carbonate, but the danger is far less in the dry than in the wet process. Dry pressed bricks are dried in the kiln, and as the faces are protected and the ends largely go through close setting, any efflorescent salts must come to the surface through the sides where they will do little or no harm. The small percentage of calcium chloride formed, if it has any appreciable effect, would be an advantage because dry pressed bricks must be very slowly dried. I believe that if the difficulty is overcome by the use of barium it must be through the use of it in the form of chloride. The stiff mud process need fear no efflorescence in the wall if the bricks are burned to the non-absorbent stage. Where the moisture cannot get in the efflorescence cannot get out. The stiff mud meets its trouble in the drier and to a greater degree than in the dry press, and some manufacturers who have changed from dry press to stiff mud, have found themselves in the fire instead of the frying pan. The addition of water brings the sulfate of lime into solution, and in the dry house this comes to the surface. Time is necessary for this solution, and the slower the drying, the longer the water acts on the sulfate, and the greater the amount of sulfate finally brought to the surface. This, in many instances, is the so-called “kiln white” or “scum,” and the use of barium and quick drying is our only solution at the present time. I have found that the best method of introducing the barium is with the water added in the wet pan or pug mill. The water is drawn from a tank holding a definite supply, to which the weighed quantity of barium is added, and kept in suspension by a stirring device. There is a “kiln white” or “scum,” which comes on the bricks in the kiln, and concerning which we have little information and no solution. It is not limited to the wet process but is more common to it. The use of wet, dirty, sulfurous coal and wet ware in the kiln tend toward its formation, but so far as the wet ware is concerned, I think we are getting drier white confused with the kiln white. It occurs in the draft spaces and often spreads out on the sides of the brick like a fan, just as flashing shows where bricks are crossed in the kiln; it therefore follows the flame. That it is a sulfur compound, we are reasonably certain, but that it comes from the clay, we are not so sure. It is always worse toward the bottom of the kiln, but this may be only apparent because of the lower temperature not burning it into the bricks and masking it. The best evidence that it is not from the clay is that we have frequently found it on the edges of the draft spaces of the fire brick kiln floor. In appearance it resembles, when clean, the white coating of antimony on charcoal before the blow pipe, but it is usually a dirty grayish white. It is too insoluble and too infusible to be a deposit of volatilized alkaline sulfate. Our only remedy is dry, clean coal low in sulfur, and thoroughly dried ware. Much remains to be done on the scum problem, but the first step is a careful distinction between the scumming belonging to the drier even though produced in the kiln, and the scumming produced in the kiln. To the uninitiated the dry press has one great charm, in that the bricks go direct from the machine to the kiln without drying. The drier, that center of trouble and discussion in stiff mud bricks, is eliminated. As a matter of fact, the dry pressed bricks are more difficult to dry than the stiff mud, and require more care. The reason is obvious. The preparation of the clay for the mud brick develops the plasticity, and the particles making up the skeleton structure are coated with the plastic material, cementing them together. Moreover, the particles themselves are softened, allowing a more intimate union of the particles and matrix, and a more perfect adjustment under pressure. When the bricks first come from the machine, they are comparatively soft. They are what they appear to be, a mixture of granular particles with a plastic material. After a while they assume what we call a leather hard condition, without any appreciable drying having taken place, due, I think, to a further development of the colloid properties, or a further softening of the harder particles, either of them absorbing water from that portion already developed or softened. This is the best condition for re-pressing. Such is the primary bond of the mud brick, and we hardly realize how strong it is. The drawing together of the particles in drying, even when the bricks are weighed down as they often are when stacked on a car, is but a small part of the strain to which the bond is subjected. The shrinkage strains are far greater. The outer surface dries first, and shrinks, or tends to do so, while the inner core is still wet and of full size. It would be absurd to assume that the inner core is compressed by the outer casing. The force necessary to compress clay in such condition would break any of our brick presses, and we hardly accord the primary bond such strength. We cannot believe the clay possesses elastic properties to relieve the strain. We must conclude that the bond is disrupted, and innumerable minute cracks formed, greatly reducing the actual points, or surface, of contact, while the strains are continually being reproduced so long as shrinkage continues. Through it all there is no visible rupture of the bond. In dry clay the bond is largely mechanical. The colloid properties are not developed, and if the particles are coated at all it must be with dust and at best imperfectly. When the pressure is applied, the particles are forced against each other and into each other and held there by interlocking, assisted, of course, by whatever colloid properties may have been developed. The dust fills the interstices under various degrees of pressure according to its amount, and the protection it has received in the interlocking of the particles, and the opportunity for the escape of the air during the final pressure. The air, in its escape, may play the further role of sweeping clean the points of contact of the interlocking particles. We have found that crop clay, which was highly plastic by the wet process, had a much weaker primary bond than the same clay from under the hill. Finely ground it was worse than coarsely ground. In working such clays, we frequently found it necessary to introduce ground bats in order to give the skeleton structure. The sharper the grain of the grog so added, the better the primary bond. The introduction of such material is not to be recommended for a high grade brick. Quite the contrary. Plastic clay finely ground, other things being equal, insures a better final bond in the burning, and in every way makes a better brick. We introduced grog to hold the brick together until we could burn the brick, but we limited its use as much as possible. Bricks held together by such doubtful primary bond must be very carefully dried, in order to preserve the bond for the finishing touch of the fire to make it permanent. Drying in the kiln from five to twelve days is the rule, and in some case two and three weeks are required. It is more a sweating process than a drying one, so slowly is the moisture taken off. Rapid drying would loosen the particles, which would not reunite in burning, and the result would be a rotten brick. It is not practical to vitrify dry pressed bricks. This follows as a corollary of the drying. The primary bond in the green brick becomes the permanent bond in the burned brick. As we have seen, the primary bond in the mud brick is due to the colloid bodies, and to the finely disintegrated material presumably carrying a higher percentage of fluxes, cementing the larger particles together. The finer state of division alone is sufficient to explain the more ready fusibility of the matrix. The same force which holds the green brick together, continues through the burning, drawing the mass together, until the desired degree of fusion is obtained, and the brick becomes an impervious mass, which is the degree of vitrification I am considering. We might carry the degree of fusion further and the brick will retain its shape until the particles making up the skeleton are dissolved. Not completely, of course, because this stage marks the limit of vitrification, but there is a wide range between the fusion of the matrix to an impervious mass and complete fusion of the whole structure. This range is the safety of the mud process in the production of impervious products. In the dry process the contact of the particles of the skeleton forms the bond. The shrinkage is comparatively little, and is not due in any marked degree to the included fine material. To vitrify, we must fuse the particles of the skeleton mass, which stage marks the limit of practicable vitrification in the mud brick. In the one case the matrix fuses and contracts, carrying with it at all stages the larger particles, and imperviousness is attained with its fusion; in the other the fine material may fuse and collect in the bottom of the cells formed by the larger particles, running into and around the points of contact, cementing them together into a permanent bond if we wish to stop at that stage, but only partially filling the cells, and imperviousness can only be effected by the softening of the cell walls themselves and the closing in upon the fused fine material contained therein. An impervious mud brick may have a stony structure, while an impervious dry press brick tends toward a glassy structure. I have seen many samples of beautifully vitrified dry pressed bricks produced by the experimentalist, or promoter, or machinery manufacturer, to show what can be done by the process, but they overlook, or ignore, the fact that in practice the ware in the bottom of the kiln is under pressure, and a brick that keeps its shape on top of the kiln will lose it a few courses lower down, and they also ignore the fact that a column of bricks ten feet high, closely set as they are in the kiln, must carry a long continued higher temperature on top to produce the proper results in the bottom, and to withstand this there must be a wide range between the point at which imperviousness is reached and complete vitrification takes place. The mud brick has this range and the dry press has not. My explanation of the bonding effect of burning is crude, and I must ask you to consider it rather in the light of an illustration than an explanation of facts. From the foregoing we naturally find the limits of the dry press process. It is only suited to the manufacture of building bricks, but in this it excels. Its only defect is its lack of imperviousness, and perhaps the difficulty of overcoming efflorescence in the wall. In the production of ornamental bricks, it is limited by the immobility of dry clay under pressure. The designs are generally flat. The high reliefs and deep indentations possible in plastic clay are not practical in dry press work. The cost of manufacture by the dry press is slightly higher than by the plastic clay, due to the longer time and greater amount of fuel required in burning more than anything else. In either case the cost follows the value; we cannot make a fifteen-dollar brick by a five-dollar treatment, as many prospectuses would make us believe. The dry press has been exploited as a process for fire brick without success. Some No. 2 fire brick are being made, but they are not representative fire bricks. Because of the weak primary bond, the backs of the bricks are frequently cracked and torn from the strains in the kiln where the bricks are crossed in setting, and the necessity of carrying the temperature to the softening point of the skeleton structure to insure perfect bond, causes deep kiln marks, both of which are undesirable in fire bricks but of no consequence in building bricks. We have made fire bricks on the dry press as far back as 1886 out of No. 2 fire clay, crushed sandstone, and flint fire clay. The latter lacked nothing in refractory qualities, but the bricks lacked the fine grained skin coating which protects the mud fire brick, and enables it to stand the wear and tear in shipping and handling and at the same time is more pleasing to the eye, both of which are important factors in selling. The sand-lime people are now doing what we did with our crushed sandstone, except that we were working for a fire brick and used no lime. Such products were possible on the roller cam machines, but I doubt if the earlier styles of toggle joint machines would have worked them successfully. Our only difficulty was with the excessive wear of the moulds and dies, which made bad edges. With badly worn dies there would be no pressure around the edges and at the corners and without pressure there was no primary bond, and the edges and corners would crumble off in handling either before or after burning. Mr. Burt: I would like to ask Mr. Lovejoy a question. It has always been a thing hard for me to understand why the roofing tile manufacturers have not yet decided whether the vitrified or open porous roofing tile is the most permanent. As to the question of imperviousness of the bricks, I want to know whether he merely means that the brick is vitrified, or whether it is a question of weather-resisting power. As far as I know, bricks made in ages past, as porous as they could be, have stood for ages. Today, they are urging vitrification, as if this was necessary to withstand the weather. Mr. Lovejoy: That brings out a great oversight in my paper. I never made any common brick, and this paper relates to face brick. The question of imperviousness has been the subject of much discussion between the mud and the dry press brick manufacturers. By imperviousness we mean brick that will not absorb any water. The dry pressed brick will absorb any water that touches its face; and ultimately you will find any building made of dry pressed brick which has stood many years, streaked with dirt, and it is absolutely impossible to get it off. The mud bricks, burned to the non-absorption stage, will get as dirty as the dry pressed brick, and even more so. In fact, an enameled brick in the city will get dirty quicker than the dry pressed brick. But one great argument, and a very forceful one, used by the impervious brick manufacturers is that “our brick can be cleaned and the dry pressed brick cannot.” There is no question in either case as to weather-resisting properties. If burned sufficiently hard, as it should be, either will resist the weather. At first, the dry pressed brick manufacturers had to fight that question, whether it would stand or not. I know of dry pressed brick laid in a street pavement, eighteen years ago, and it is still there; but yet it is not desirable for paving. Mr. Wheeler: When you say “impervious,” do you know the percentage of absorption? Mr. Blair: I want to make a suggestion in the way of encouraging further investigation along this line. The writer of this paper throws out a suggestion, clothed with doubt, as to what the discoloring matter was, whether sulfur entered largely into it or not, or whether or not it was the sulfates. I want to state a little experience that I have had along my own line. We make of course, or undertake to make, impervious stiff mud brick. We were troubled by this white coating, so far as the use of the brick for building is concerned. I once approached a gentleman who stands high in our own state as a chemist, and he said he would be able to tell me in a day or two what the trouble was. The only experiment I ever made in regard to this question was to scrape off the entire surface from a dry brick, just from the drier. No matter what kind of coal was used in burning, I never found any discoloration on the outside of such a brick. This would seem to show definitely that it is an accumulation taking place in the drying and not in the burning. I related the same story and submitted the same questions to Professor Noyes, but he was utterly unable to determine just what that is and just how it occurs. I am informed that some scientific board in France has set aside a hundred thousand francs for the determination of this question. President Gates: I think this is brought out in the paper and attention is called to three distinct classes. Your case is evidently in the second class. When you come to read this paper you will find it very clearly defined. Mr. Lovejoy expressed doubt only in regard to one very different kind of efflorescence. Mr. Yates: I will ask Mr. Lovejoy whether he ever saw this efflorescence or scum upon the outside of a thoroughly vitrified brick? Mr. Lovejoy: Well, I most assuredly have. It comes out in the dryer, and when you put the brick in the kiln to vitrify it, it fixes upon the brick. If you introduce some reducing action, when burning the brick, you get a color which masks or obliterates the scum, if you are making buff or cherry red. There is no masking that dryer white in paving brick. It is there and it is going to stay there. Mr. Parmelee: Mr. President, the French Journal on Ceramics recently mentioned rather a curious method of getting rid of efflorescence on brick, which was said to be patented. The brick is treated with a spray which forms a coating. The paper does not say what it is. The bricks carry that coating into the kiln. During the process of drying and firing the salts come out of the brick, the coating falls off in firing and carries the efflorescent salts with it. Mr. Stover: I have a house which I built eight years ago of vitrified brick made in Ohio, paving brick. I had the brick rock-faced and I have been congratulating myself on having it rock-faced, as I got rid of the scumming. Up towards the roof, at the top, there is some scumming. It may be they are not perfectly vitrified brick, as I never tested them. President Gates: Many bricks supposed to be vitrified are not, to which, I think, Mr. Lovejoy called attention. Mr. Stover: Scraping off the surface in that case would not seem to cover it. President Gates: That is the first class he called attention to. Mr. Lovejoy: That is the point I tried to bring out, the different kinds of white scum. Kiln white, which you get in the dryer is sulfate of lime, burned into the brick, and is there to stay. You can remove it by rock-facing. In the case where the scum appears after the brick is laid in the house, there no doubt must be remaining in it some sulfate which is brought to the surface. The dryer white it brought to the surface and burned in. The kiln white is one feature we do not understand. There is a distinction between kiln white and dryer white, causing the greatest confusion. There are very few manufacturers that notice dryer white, though it comes to the surface in drying. They pay no attention to it until it is brought out in the kiln and then they call it kiln white. In my own experience last year I found unquestionable kiln white not only on the end of bricks but on even the fire brick of the kiln floor.